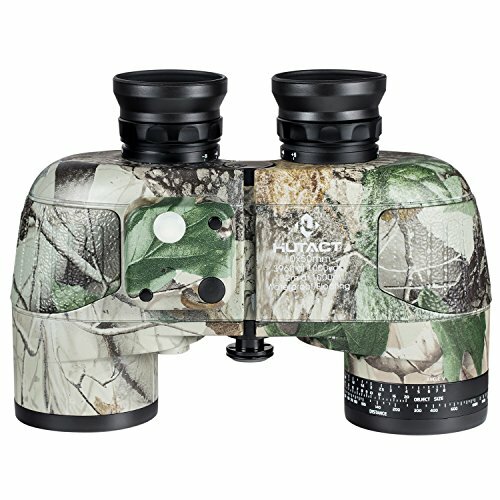 A military binocular with built-in compass and range marks allows you to get the approximate distance and size of the direction and object through the binocular. This is a military binocular you deserve. It is suitable for tourism, hunting or off-road, and all outdoor activities. It is equipped with a large, pure optical structure and a high-quality coating, which allow you to acquire an excellent visual experience. HUTACT is an American brand, focusing on optical research and development and making photoelectric imaging and photoelectric display as development direction, devotes itself to the innovation and application in the optic field, offering high-tech and high-quality service to our customers, innovation is the driving force for the development of HUTACT! Military specifications - Built-in digital compass, real-time direction, built-in ranging ruler (through the ruler can manually calculate the distance of the objects); suitable for tourism, hunting, cross-country and all outdoor activities. Pure optical lenses - FMC multi-coated optical lenses, 10 times magnification, 50mm large objective lens, which allow you to get large and clear vision due to the high penetration of the lens and its high light collection, and make distant objects and landscapes clearly shown in your eyes. Excellent structure and product configuration - You can adjust the sharpness of the left and right eyepiece, suitable for those users whose left and right vision is different. The eyepiece rubber skin can be turned down, suitable for users who wear glasses. The product is equipped with a thick neck strap and elastic shoulder strap, allowing you to carry this large binocular to the outdoors and to release your hands, which make you feel easy and comfortable. Complete configuration - 1 Military binocular; 1 eyepiece cover; 2 objective lens covers; 1 neckband; 1 shoulder strap; 1 color box with user guide; 1 lens wiping cloth. HUTACT worry-free after-sales service. If you are not satisfied with the product, you will be entitled to a refund within 30 days. You can unconditionally return the product and get a full refund without any explanation. You can enjoy a worry-free shopping! If you have any questions about this product by HUTACT, contact us by completing and submitting the form below. If you are looking for a specif part number, please include it with your message.